I think there is a Springfield in almost every state in the United States, but the one closest to Chicago is the one that gets my attention as there is a lot of great music that comes out of that city. Black Magic Johnson is no exception, having honed their skills by putting in a lot of hours gigging around the area. Despite the band’s busy schedule, they have managed to take the time to put together their newest CD, Call Me. 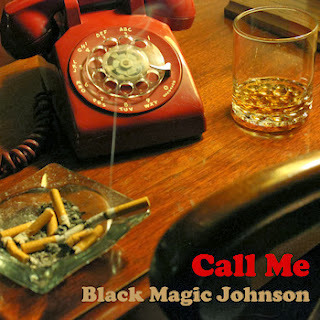 Black Magic Johnson is led by Reggie Britton, who wrote all twelve of the songs on Call Me and performed the lead vocals as well as the drum and harmonica parts. He is joined on this album by Alexis Rogers and Dan Grover on guitars (and background vocals) while Willie Chrismon and Bob Hagler split the bass duties, and Suit & Tie Guy worked the keyboards. By the way, Suit & Tie guy has to be one of the best musician names I have ever run into. The band’s songs are mixture of genres that includes rhythm and blues, rock, soul and even a little country and gospel thrown in for good measure. But all of it is good-times music with lots of vocal harmonies and a heavy emphasis on guitars, which Rogers and Grover do an admirable job with. You will hear all of this on the first track, “Crazy About You Baby,” which has a nice Chicago blues flavor. This upbeat song is fun with simple lyrics and a jaunty syncopated rhythm guitar that pops along with the snare. The funky “Loving Ways” is the next one in line, and Britton shows that his songwriting is versatile, as the lyrics are a bit more complicated. Sticking to the old standby relationship subject, he paints a picture of a saint of a woman using some really fun rhymes. The guitars are scorching on this tune, and everything comes off a little distorted. Then the band switches gears quickly with the slow and soulful “Standing By Me” which makes liberal use of acoustic guitars and Suit & Tie Guy’s Hammond. My favorite song on this album is “Water from a Rock” a rollicking eight-bar blues tune that is built on the foundation of a doubled rhythm guitar and bass line. The music is good, but the lyrics are what make this stuff real. This is pure wit as Britton addresses the unrealistic expectations of another: “You want water from a rock / and blood from a turnip, baby / and sunlight under your shade tree.” Too true! Most of the songs on Call Me are the usual four to five minutes, but they squeezed a couple of longer ones in too. The risqué (at times) “She’s Got Everything” clocks in at almost eight minutes, not because they threw in a couple of extra guitar solos, but because there were just a ton of things they wanted to say and that was how long it took to get the job done. 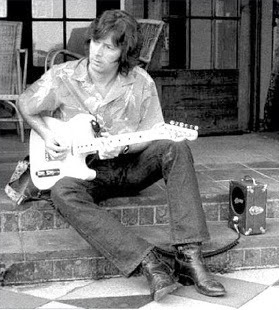 The slow-burning blues song “Love So Cold” is a tick over 10 minutes. This song does not shortchange the guitar parts at all, and in fact it is so heavy that it would fit in perfectly with the blues rock of Led Zeppelin’s first album. Suit & Tie Guy brings a few different keyboard sounds to Call Me, most noticeably the distorted synthesizers on “Blues Traveler” and his fine organ work on “All Tore Up,” which are both placed near the end of the CD. Then, after spending eleven tracks proving what good musicians they are, the band chose to end the album with a short a capella soul number, “Thank You Baby.” This is really the only opportunity to hear their voices without any coloration or distraction from the instruments, and with their sweet harmonization it turned out really nicely. Black Magic Johnson created a very good album with Call Me, and I am impressed that they put together a collection of a dozen solid tracks without having to use any cover tunes. The lyrics and score are consistent, and there is a not a clunker in the bunch. You can find them gigging around the Springfield, Illinois area on most weekends, so be sure to check them out if you get a chance -- I am sure you will have a great time! 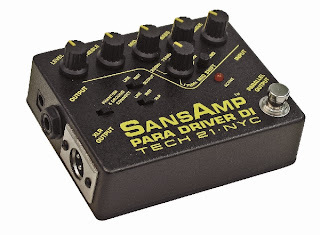 I have plenty of DI pedals, and mostly I prefer ones that provide a clean signal, but lately I have been messing around with DI boxes that can also shape my sound, and the Tech 21 Para Driver Pedal gets pretty close to a tube tone. Tech 21 has been around since 1989, when a guitarist/electronics guru developed the first SansAmp tube amplifier emulator. In the years since they have introduced a wide array of products, including effect pedals, midi controllers and even a line of amplifiers. Their products are well-regarded by musicians, they manufacture stuff in the US, and they have very good customer service. The Para Driver DI is housed in a smart-looking matte finished black case. It measures about 4.5 by 3.5 by 1.5 inches, and it weighs around ¾ of a pound. On top are the footswitch and five knobs: Level, Drive, 3 EQ knobs, and a mid shift knob. You will also find a blend switch, line/instrument switches the XLR and 1/4 outs, and a phantom power switch. On the right side is the ¼-inch input, and on left side are the ¼-inch and XLR outs. This SansAmp runs on a 9-volt battery, or you can buy an adaptor to plug it into a wall. If it is plugged into a mixing console, you can ditch your AC adaptor and run it off the board’s phantom power (that is what the phantom power switch is for). Neat! Like the originals, the SansAmp Para Driver DI plays the role of a preamp that sounds like a mic’d speaker cabinet that is being driven by a tube amplifier, using no real tubes and 100% analog circuitry. After plugging it into my Genz Shuttle, I pulled out the user manual and messed around with their recommended sample settings. 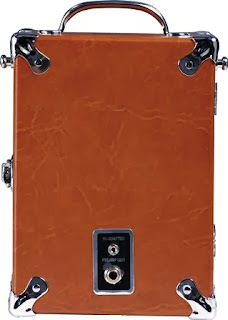 The active tone controls allow +/- 12 dB of boost or cut. 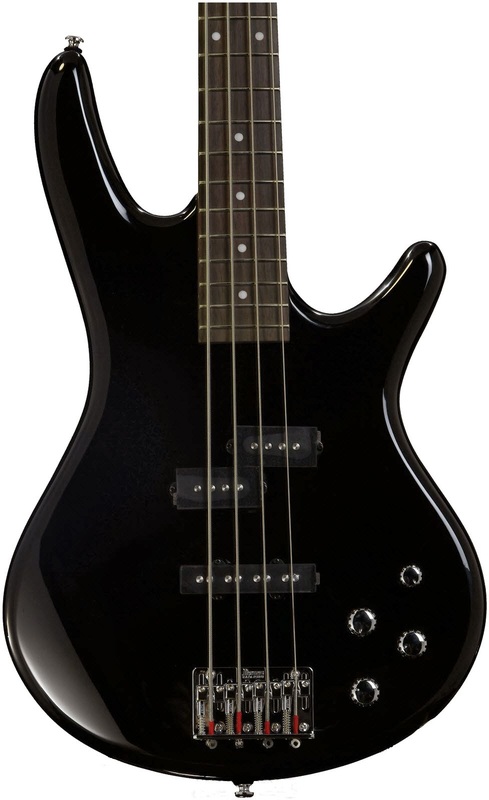 With my trust P Bass it took no time at all to get a solid SVT, Jaco or upright bass tone. This thing gets very close and many of the sounds I got out of it were very useful. This Tech 21 unit was not designed just for bass though, so I also took the opportunity to put my Martin and Stratocaster through it. I used the blend control to take some of the weirdness out of the piezo on my acoustic, and I got some unholy gnarly rock sounds when driven hard with my Fender. This is really a versatile pedal, and I did not find any of my instruments that it would not work well with. As a direct box, the Para Driver DI delivers the goods too. With the blend switched off and the EQ set flat it delivers a pure tone from my guitars and basses to the mixing console. The equalizer is still functional, so the tone can still be fine-tuned by the user and the switchable mid selections can really help a bassman find his or her sweet spot. The Tech 21 SansAmp Para Driver Preamp Pedal is a great unit, and if you like the tone it will sell itself. It has a list price of $275, and street price around $200; if you buy a new one it comes with a one year limited warranty. Check one out for yourself, and see if it is what you are looking for. Today we are looking at a very nice La Patrie Collection model classical-style acoustic guitar, which is their top-of the line instrument. La Patrie is an offshoot of the Godin family of guitars and their instruments are made in La Patrie, Quebec. I think Canada may have more luthiers than hockey players. Maybe not. I first heard of La Patrie guitars when I was doing some research on a Simon & Patrick acoustic guitar (also made by Godin), and I noticed that this the parent company’ line of classical guitars. Since then I have played their Presentation model (one step from the top), and figured that I had better compare it to the Collection model. The rest of the specifications list contains no bad surprises either. 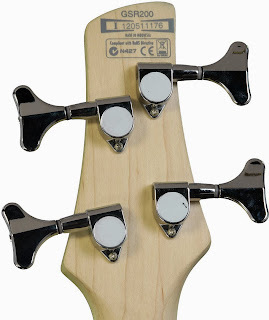 The black and gold lyre tuners are nice quality and hold well. La Patrie also equipped it with a first-rate Tusq (by Graphtech) synthetic bone nut and bridge saddles, and a rosewood bridge. I mentioned earlier that the frets are good, and the overall construction is very nice too. The finish is pretty and the braces are nicely cut and glued, and I cannot find a visible flaw on this instrument. The last pieces of the puzzle are how the Collection plays, and how it sounds, and the results are mixed. I like the feel of the instrument. For a classical guitar it is a little heavier than I expected, coming in at almost 5 pounds, but it is nicely balanced. 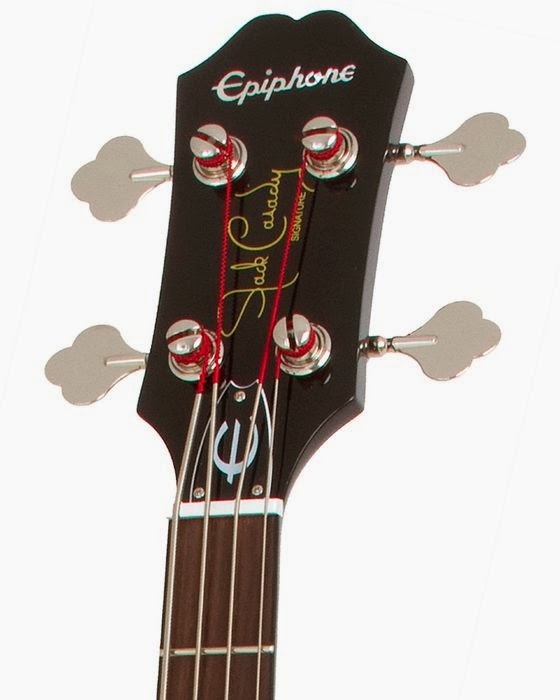 The thinner profile neck is very comfortable, making it feel a lot more easily (king of like a steel-string acoustic). The action is a tad high, but I was able to get around the fretboard with no troubles or buzzing. Unfortunately, tone is where this La Patrie guitar falls short. It has a muffled sound, like the top is not able to resonate freely. Despite the company’s assertions that they apply a super thin layer of lacquer, this thing seems like it has a ton of finish on it. The Presentation model I played had a lot thinner finish, and a lot better sound. Also, I have to wonder if the thinner neck is giving less of the juicy classical guitar sound that I expected. Either way, this guitar is just not working for me, and I am disappointed that their top of the line model does not sound as good as their cheaper instruments. This one might just be a clunker, so I have to recommend that you try before you buy. MSRP on the La Patrie Collection is a mere $825, with a street price of about $695 and I see them on the used market for around 400 bucks. Be careful, my friends! I do not know if it is hubris or a marketing ploy, but at some point in time many guitarists think about getting personalized guitar picks made up. In the old days this would have been a pretty tough task, but in the age of the internet this is a surprisingly easy task. After searching around, I decided to order my picks from pickworld.com, which is a division of the Wilmington Fibre Specialty Company in Delaware. My decision was based on checking with other bands and musicians to see who they used, as well as their prices and options, which are all pretty darned good. There are myriad choices and prices for their picks, all of which are clearly listed on their website. You can choose any shape or color you can imagine, in a variety of materials, including, celluloid, Delrin and PVC. Printing can be done on one or two sides, in oodles of colors, and you can even have them imprinted in gold foil (very classy). And you can order any amount you want, in quantities as low as 25 for $25. What a cool Christmas of Hanukah present that would be! Oh, yeah. And their picks are all made here in the United States. I stuck with traditional heavy thickness celluloid tortoise shell 351 picks. This is the most common shape around, and these are the ones that I actually use when playing guitar. 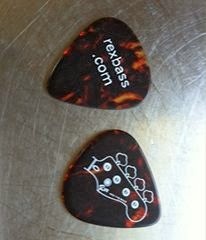 Ironically, I do not use picks when playing bass, even though I run rexbass.com. It was easy to order, as I submitted my art via email and placed the final order via phone. It took only a few weeks to get my bag of picks, and they looked exactly like I thought they would. A 1000 screen-printed picks with my web address on one side and my logo on the other set me back $260, which not too bad when you consider I can reach that many new viewers for only 26 cents each. The picks have worked out well, and I pass them out like a mad man. Other musicians love to get something for free (that they can actually use), and it is a great promotion for my blog. By the way, I have never seen anybody throw away a perfectly good guitar pick! 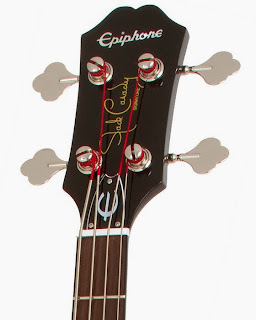 One of the cool things about some signature series guitars is that they can be completely off-the wall interpretations of guitars that have been around forever. Today we are looking at a Jim Root Artist Series Fender Telecaster that is quite a stretch from the original that was introduced 60 years ago. You may not be familiar with Jim Root, the lead guitarist for the bands Slipknot and Stone Sour. Generally their music does not appeal to me, but I love his heavy guitar tone and I greatly admire this killer axe that he helped design. You will notice that the Jim Root Telecaster has the traditional body and headstock shapes, and that is about it – everything else is different. The body is made of mahogany, and it is set up as a string-through the body hardtail. 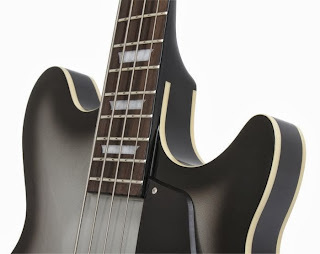 This one is sprayed with a coat of matte white nitrocellulose (black is also available). It has single-ply black pickguard that matches the black hardware and gives it kind of a Duff McKagan Jazz Bass Special vibe. 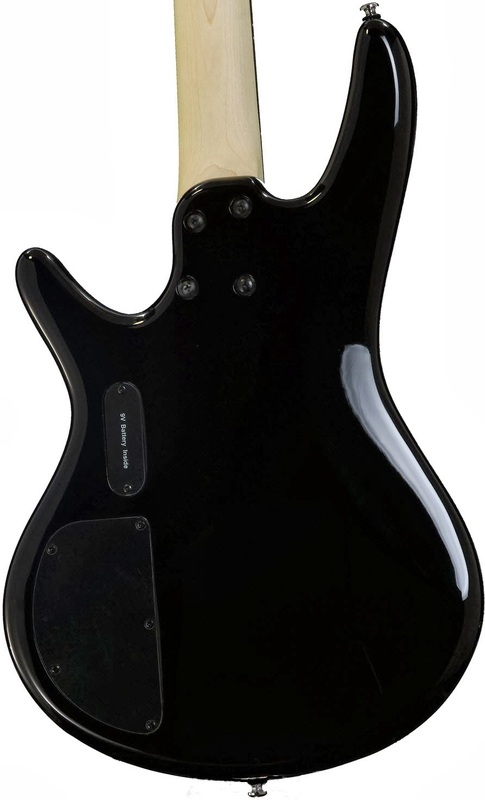 The 25.5-inch scale neck is maple with an ebony fretboard (black ones get a maple fretboard). The nut is 1.650 inches wide, and the fretboard has a fairly flat 12-inch radius. 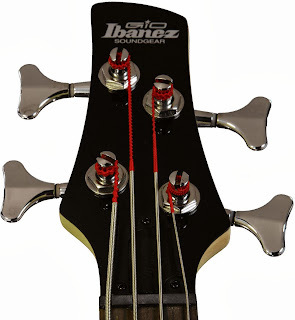 The factory installed 22 Dunlop 6100 jumbo frets, and sprayed the back of the neck with a satin polyurethane finish. Though this guitar has no tremolo, Fender specified deluxe locking tuners, which are a godsend and make string changed a snap. Root’s electronics package is not very Tele-like, either, as this is a hard-rocking machine. 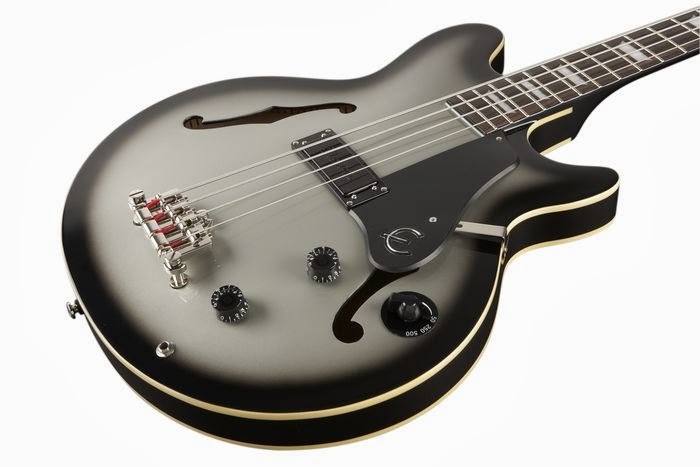 They went with two EMG active humbuckers: a 60 at the neck and an 81 at the bridge. 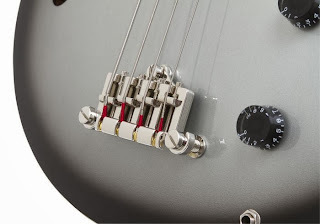 There is a master volume knob, no tone control, and a 3-way pickup selector. Not exactly a versatile set-up, but this is a purpose-built instrument. The Jim Root Telecaster is built in Mexico, but before you sniff and turn up your nose at it because it was not built in the US, you might want to see what a great job they did on this instrument. The finish is beautiful, the neck pocket is tight, and the frets are cleanly trimmed and are perfectly level. This is a well-built instrument using first-class materials and it lacks for nothing. It is a fine playing guitar, but the true magic is in its tone -- this thing is the hammer of the gods. The EMG pickups have tons of headroom and can attain amazingly clean tone or a thick distortion like nobody’s business. This is obviously not going to be a good country guitar anymore, but it will do rock and metal all day long, with most any tone you are looking for by varying the volume and switching the pickup selector. If I was expecting this to play all genres of music I would miss the tone knob, but I understand the purpose of this instrument and it is truly the best tool for the job. So what is the bottom line? The Fender Jim Root Artist Series Telecaster is one of the most expensive Mexican-built Fender I have run into, with a list price of $1469 and a street price of $1199. Before you shake your head and walk away, remember all the good stuff that goes into this guitar, not to mention the included deluxe black tweed hard case. It is one hell of a value, and if you are looking for an awesome hard rock guitar, you should check one out. Musical Theatre West has been around since 1952, when it started out as the Whittier Civic Light Opera. Their productions evolved over time, and they went from being an all-volunteer operation to producing full seasons. They currently perform at the Richard and Karen Carpenter Performing Arts Center at Cal State Long Beach, which is a lovely venue with plenty of conveniently located parking. 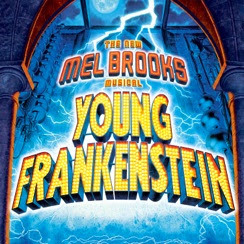 This musical is based on Mel Brooks’ 1974 film, Young Frankenstein. After Brooks had such a huge success with his stage production of The Producers (also adapted from one of his movies), he went to work on this one. He wrote the songs and lyrics and Thomas Meehan contributed to the book. 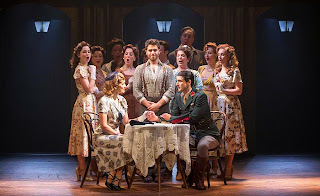 The show opened in 2007 and played on Broadway for a little over a year; since then it has been through a couple of national tours, and now it is available for regional productions. The plot and characters mirror the movie fairly closely, and the few changes that Brooks and Meehan made do not alter the final outcome. This is a musical, and all of the leads (the good doctor, Elizabeth, Inga, Frau Blucher, Igor, the Inspector and the monster) each get to take on at least one song. Young Frankenstein was well casted, and all of the leads did a super job. Their singing, dancing, acting and comic timing were spot on. The male leads include Zachary Ford as Dr.Frankenstein, Ben Liebert as Igor, and Danny Blaylock as the monster. They put on the big boy pants by taking on the roles that are personified by Gene Wilder, Marty Feldman and Peter Boyle. Liebert stole the show because his personality shined through consistently, and his character had the best lines which he nailed every time. The ladies did a lovely job too, with Andi Davis as the lovely Inga, Tracy Lore as Frau Blucher and Rebecca Ann Johnson as Elizabeth (the doctor’s girlfriend). Each of these characters was more lewd than the next, culminating in a refreshing bit of girl/girl touching. All three are very good singers, and I could find no flaws with their performances, which is quite a compliment and they also face comparisons with the top-flight movie cast. Lauren Kadel did well to follow the original direction and choreography that was put together by Susan Stroman. This is a complex (and lengthy) show, and it flowed nicely from scene to scene with no distractions. The sets were clever, but seemed a bit worn in spots, but keep in mind that my seat was very close to the stage. From that vantage point I did have the opportunity to see how good Jamie Brown’s costumes were. Jean-Yves Tessier’s lighting was very effective making the shadow dance scene come off wonderfully. Oh yes -- I loved the giant monster puppet. The 14-piece orchestra was under the direction of Corey Hirsch, and they did well, but I was puzzled that the musician’s names did not appear in the program. A big plus was that the sound was right on track with a good mix, and the actors/singers were easy to understand. It sounds like all of the right pieces are there, so what is my problem? Young Frankenstein is weak and is just not a very good stage musical. Unlike Brooks’ The Producers, this show is based on a hugely popular movie, so many of the comedic gags have been seen before. With most of the surprises gone, the flaws in the simplistic songs and awkward lyrics are very obvious-- Mel Brooks should collaborate more when he writes his musicals. Brooks’ score is simplistic and derivative of other works, and the lyrics were overly complicated and relied on dated comedic references. As a whole, none of the songs stood out as being the least bit special. Also, the nearly three-hour run time (an hour and a half to the intermission!) is a bit much to take. If you decide to check Young Frankenstein out, it is playing through this weekend, and seats are still available. Be mindful that there is plenty of bawdy adult content, and I would certainly not take a child to this show. The Musical Theatre West 2013-2014 season is looking up after this one, with The Music Man, ‘S Wonderful and Beauty and the Beast on tap. Check out their website at musical.org for details about tickets and packages. Most musicians have other artists that inspire them, and Gay Marshall is no exception. But listeners of her latest album may be surprised that the reason she got into music was the songs of Edith Piaf, the legendary French singer that performed ballads and café songs in the 1940s and 1950s. Music was not the path that Gay originally headed down, though. As a Midwestern child she yearned to be an actress, so after attending the Interlochen Art Academy for secondary school she was off to study theatre in England. After discovering Piaf, she studied her music and began to perform it in coffee shops, eventually augmenting her repertoire with show tunes, jazz and Dixieland blues. Along the way she wrote a few one-woman shows, participated in gobs of musical theatre, and recorded a CD of Edith Piaf tunes. 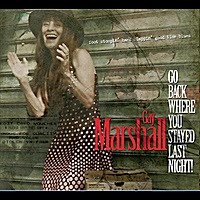 On her latest CD, Go Back Where You Stayed Last Night, Marshall shares classic blues tunes from the 1920s and 1930s. These songs were originally recorded by legends such as Ethel Waters (another of Gay’s inspirations), and Sidney Easton. These are other people’s songs with some new lyrics added here and there, but they still maintain the intent of the original versions. She is joined on this album by Roy King on drums, Mike Sands on piano, Martin Block on bass, Tony Koussa on saxophone and Bruce Lehtinen on trombone. Gay Marshall’s positive spirit shines through in all of her work, and this album is no exception. The fifteen tracks were carefully chosen so that all of these vintage songs have this same upbeat attitude. From the first track, “Brother You Got me Wrong,” you will hear that she is not going for a modern take on these songs. She has affected a 1920s singing style and the band has a gloriously acoustic sound. The score is well-arranged and Sands’ melodic piano work is the proper counterpoint to the vocal line. The title track is a fine Ethel Waters mid-tempo blues tune that would be at home in any vaudeville revue. Like the rest of the album this one has neat horn parts and fine piano playing, but the stand-out performance on this song has to be Block who thumps out surprisingly complicated lines on his upright bass. My favorite track on this disc is Joe “King” Oliver’s “West End Blues,” which gives everybody in the band a chance to shine. This leisurely 12-bar blues song lets Marshall cut loose, and she can really belt out her part. Koussa takes the intro and also plays a solo with his killer saxophone tone, and Lehtinen is given the opportunity to work a muted trombone solo in. But what is really cool about this tune is how well the band works as a group to put out a seamless piece of music. The album ends up with Sippie Wallace’s “You Gotta Know How” and Marshall once again uses her playful vocal style to match the clever lyrics. Koussa weaves his sax in and out of the verses as Sands hammers out a honky-tonk piano part to help keep the beat with King’s drums. This was a great song to finish up with, as it is a fun and upbeat piece. Go Back Where You Stayed Last Night is a neat piece of work, and an enlightening snapshot of what was going on in the musical world during the years between the wars. Thanks to fine vocals and the prowess off the band everything comes together well for this project. The album cover advertises this as foot-stompin’, hand-clappin’, good time blues” and Gay Marshall certainly delivers the goods. I just heard that the Genz Benz brand has been discontinued after almost thirty years in business, and SWR is facing the same fate. Both of these brands are owned by Fender. Genz-Benz was founded by Jeff Genzler in 1984, and over the past decade they introduced a lot of innovative and well-regarded amplifiers, especially their Shuttle series of hybrid bass amplifiers. I have used the Shuttle 6.0 for a longer than any amp I have owned, and its tone and portability have been a godsend for me. The company was part of the Kaman Music Corporation, which was absorbed by Fender for $117 million in 2007. Fender has had financial troubles this year, and their initial public offering was cancelled in July of this year as they were unable to sell 10 million shares at $13 each. Apparently the company is not as valuable as they thought it was. It is sad to see this company go out of business, but if you have been looking for a Genz Benz amplifier now is the time to buy. I have seen the Shuttle 6.2 selling for $399 and the Shuttlemax as low as $649. As far as I know, Fender will honor the 3-year warranty for these products. 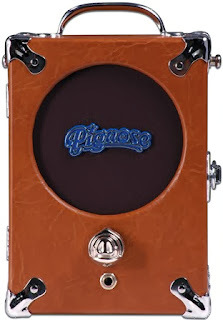 The world is chock full of useless little guitar practice amps, and the genesis for all of them is the Pignose 7-100. This model has been around since before I started playing guitar, and I have never taken the time to play one until now. Hmmm. 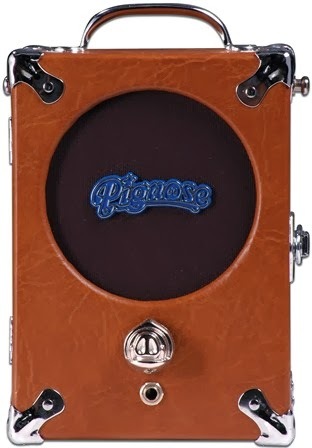 Pignose has been around since the early 1970s, and they introduced their first amplifier, the 7-100, at the 1973 Summer NAMM show. This amplifier was a hit, and continues to sell steadily to this day with very few changes. Since then they have gone on to make bigger amplifiers, guitars, stomp boxes, megaphones and some amazingly cheap wireless microphones. But we will focus on the Legendary 7-100 today. For starters, it is truly tiny and portable, measuring about 6 x 5 x 9 inches, and weighing around 6 pounds with 6 AA batteries on board. 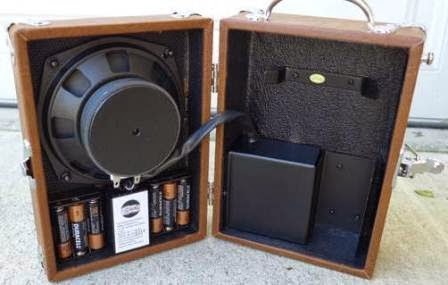 It is a nifty looking box, covered with brown tolex and hinged on one side so that you can pop the latch and open it up to access the batteries or a cavity where you can store the optional AC adaptor. In keeping with the portability theme, they included to strap buttons on the amp so you can hook up a guitar strap and sling it over your shoulder. A wandering minstrel sort of thing, I guess – but don’t trip on your cord. The mechanics of this unit are dead simple. There is a ¼-inch input, a single volume knob (shaped like a pig’s snout), an 1/8-inch jack for the power supply and a ¼-inch output. The amplifier is capable of putting out 5-watts into its 5-inch onboard speaker or providing a pre-amp signal so you can run the preamp through something bigger and better. When I opened my factory-fresh unit, there were no surprises. It is made overseas, but the quality was very good, with clean cabinet joints and wiring. I ponied up $15 for the genuine Pignose AC adaptor, as I will mostly be using this thing in my studio and in hotel rooms, and I hate buying batteries. If you choose to run it unplugged, it will run through those 6 AA batteries in somewhere around 5 hours, which is not too bad, really. With only one knob and one input I got the Pignose up and running in a hurry. I cranked my Strat and Les Paul through it and I really like the way it works. It puts out a fairly decent amount of volume – certainly enough for practicing at home or hanging around the campfire. It is not ear-splitting or anything like that, but it gets by. At its highest levels the sound breaks up a bit, and not in a pleasant way, so I do not take it much above 8/10ths. The sound is not exactly as advertised by the Pignose folks, though. Their promotional materials state that the 7-100 “…features a full array of tones from clean to crunchy.” Nuh uh. There is no clean to be found here. This amp has one sound, and it is a nice dirty crunch that is marvelous for rock or blues. If you are looking for super-clean sounds, this is not the amplifier for you. In my case, I love its tone, so I have no gripes about the sound. By the way, I used the ¼-inch out to send the preamp signal to my mixing board, and I got the same tone. If I could add one thing to the amp it would be an auxiliary input so I could plug in an iPod to practice along with, but I am cool with it the way it is. They have stuck true to their design over the years, and for the money I think it is a great deal. If you like the way the PIgnose 7-100 sounds, it is not going to cost you an arm and a leg to pick one up. The brown tolex ones sell for around $75 online and the tweed print models sell for around $90, and those prices include a 6-month warranty. At this price point I would stick with buying a new one to avoid the headaches of buying somebody else’s abused old junk. Check one out for yourself! 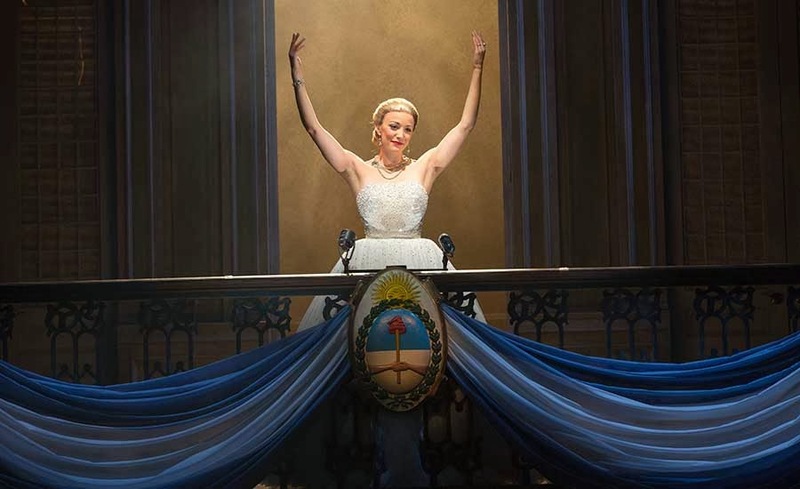 Somehow I have managed to make it this far through life without ever seeing Evita, one of the more popular modern musicals. Well, I remedied this oversight last weekend at the Pantages Theatre in Hollywood, California. The plot of Evita is fairly simple. It is the story of Eva, a young woman from the country that used everything she had (in every way possible) to claw her way to the top. This culminated in her marriage to Juan Peron (who would become president), and she became the spiritual leader of Argentina. She died of cancer at the age of 33, and reached a level of sainthood amongst a portion of the populace. This musical provides a decidedly one-sided view of these events, so I would encourage you to do some research on her, as it is quite an amazing story. This is a wonderfully written show, with music by Andrew Lloyd Webber, and book by Tim Rice, and it holds up well from when it was first produced in 1978. There is very little dialogue that is not sung, but the story still comes across loud and clear. Overall, the musical is very well-regarded, and it has won a trunkload of awards over the years. 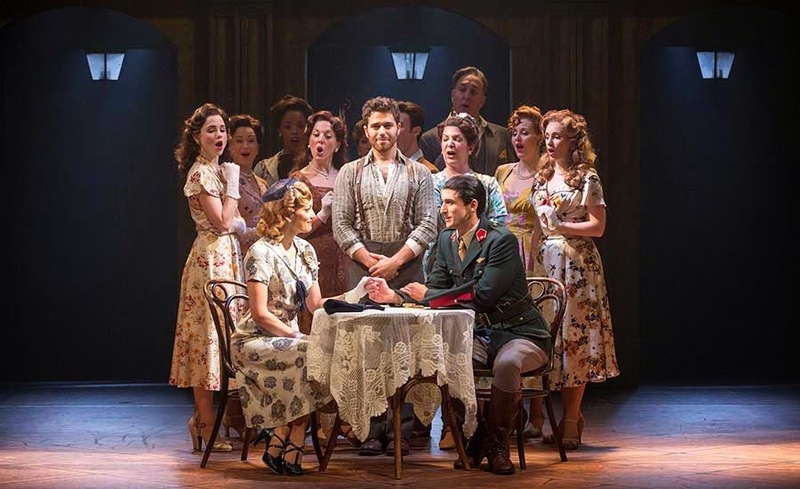 The 2013 version of Evita is a touring production, and it is making stops throughout the United States. 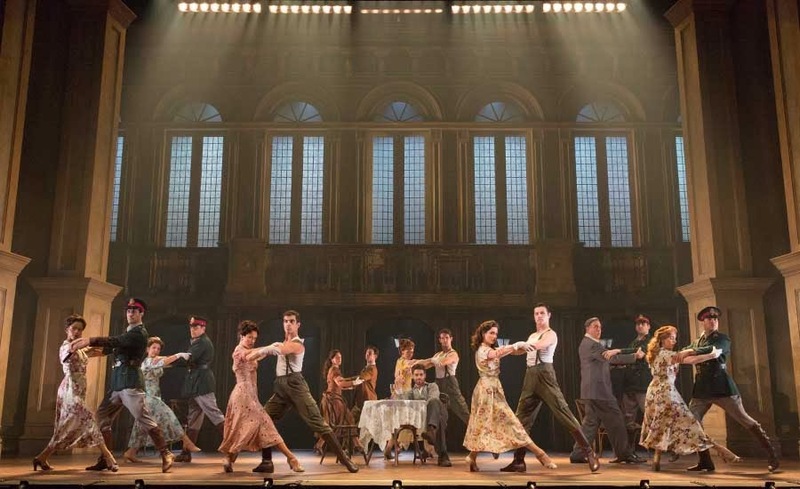 The creative staff have done a wonderful job, with Michael Grandage taking the directorial role, Rob Ashford as choreographer, Christopher Oram with scenic and costume design and Neil Austin with the lighting. They took all of these elements and created a very tight show. Caroline Bowman took the lead, and Eva has to be one of the most difficult musical theatre roles ever. There is a metric ton of stage time, and most of it is spent singing complicated lyrics. She played the role well, as she had the chops to pull off the singing, dancing and acting. Che (the narrator) was played by Josh Young, and though this character is like tape that covers over significant holes in the story, he did a very nice job with it. And lastly, Sean MacLaughlin played Juan Peron, which was a surprisingly small role for the president to take. Over 20 cast members were in the ensemble, and they helped make the show for me. They were great singers and dancers, and a good chorus is the essential glue that holds a show together. William Waldrop conducted the 17-piece orchestra that was mostly staffed with local musicians. Keyboards were used extensively to help make the mood in many of the scenes, and overall the orchestra did a fabulous job. There were no miscues or odd dynamics that drew away from the onstage action, which is just as it should be. 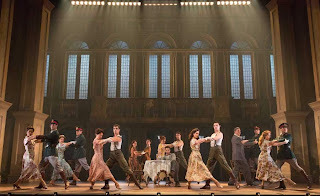 Evita’s sets are first-rate, and in current style are relatively simple and are repurposed to achieve different effects and scenes. I especially liked the building façade that could be made into an indoor or outdoor scene simply by moving it, rearranging the chandeliers and re-lighting it. 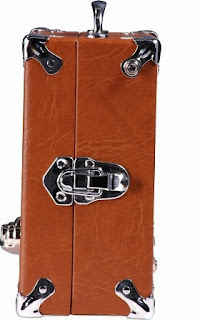 Also, the conversion of Eva’s steamer trunks into a dais and her hospital bed into a coffin were quite clever. They were able to provide historical newsreel footage concurrently with some of the scenes, which could have been confusing, but actually worked out very well. I heartily recommend that you get out and see Evita while it is still in Los Angeles, so you had better hurry before the show closes on November 10. And if you live out of the area, this is just the start of their tour, and they will be travelling all over the country before they finish up in June 2014 in South Carolina.